Craft beer, crafted food, crafting memories. Beer, food and sports are better together, so we opened a family-friendly sports bar where you can raise cheers for all three. Our team of hospitality pros runs our Michigan restaurants as passionately as it runs our hotels. Quality drives us from the great atmosphere to the creative menu, everything’s in a league of its own. As a scratch kitchen of eager locavores, only fresh and local ingredients make the cut. But food and ambience are nothing without exceptional service—we empower all of our team members to not only meet your expectations, but to hit them out of the park, too. How do homegrown all-stars become heroes of the bar, grill, and gridiron? By recruiting people who not only like food, beer, and sports, but those who also have a natural talent for attentive service, careful preparation, and insightful innovation. And along with our parent company, Suburban Inns, over 400 employees, 13 locations, and countless unforgettable experiences, we like to think we have an eye for it. From classically trained meal-builders to hop-smart bartenders and servers who go above and beyond their titles, our collective years of knowledge help perfect every Big E’s meal and moment. With three convenient Michigan locations, you’re never far from a front-row view of your favorite games, grub, and glasses. Dine in or carry out, you can plan your next outing—or three—by finding a Big E’s Sports Grill near you and reading up on our top draft picks from Midland, Holland or Grand Rapids. Giving back to our communities is just something we do. It’s not a business strategy: it just feels right. Looking to do a fundraiser or have other ideas? Give us a call. Grand Rapids Business Journal. 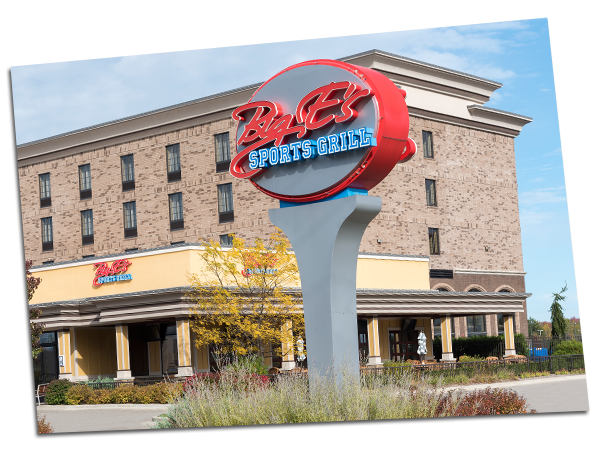 Big E’s Sports Grill — a restaurant chain owned by Hudsonville-based Suburban Inns — held a grand opening this month for its new location inside Michigan’s first Embassy Suites by Hilton, at 710 Monroe Ave. NW. Big E’s Midland and our Loaded Tots are featured in an article by OurMidland.com. Looking for a fun and exciting place to work? Big E’s is always looking for positive-thinking individuals who can provide a quality of service that exceeds expectations in a diversity of sports bar jobs, from chefs and cooks to servers, bussers and beyond. A uniquely local bar and grill experience for sports lovers, featuring homemade food, an abundance of television screens, and taps of your favorite domestic and craft beers, as well as local Michigan ciders, meads and more.